Jaren is a graduate of Parker School, Class of 2015, and is now a rising sophomore at the University of Rochester pursuing a major in optical engineering with minors in mathematics and astronomy. Jaren was born and raised on the Big Island of Hawai‘i, where he cultivated his love of sciences in the presence of the telescopes on Mauna Kea. He is primarily interested in the optical systems of telescopes and spacecraft, and is looking into expanding his interests in astronomy and integrated nanophotonics. 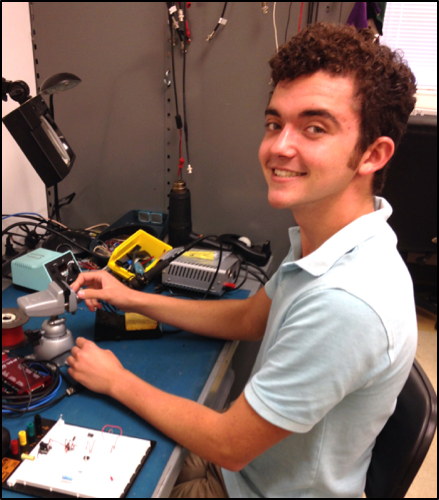 Jaren is involved with his university’s Optical Society (OSA) chapter and Makers Club, where he is able to work with others on various engineering projects throughout the year. Jaren hopes that one day, he will be able to return to Hawai‘i to pursue a career in optics, as well as build up a STEM enrichment program to benefit the next generation of scientists from Hawai‘i. By examining the solar infrared radiation from the Sun, astronomers can gather important data regarding its physical properties. The Daniel K. Inoyue Solar Telescope will use the Cryo-NIRSP instrument for spectropolarimetric observations of the Sun’s corona. The Cryo-NIRSP instrument is very sensitive to incoming solar radiation, so when examining the corona, it must not be exposed to the solar disk flux, which is almost 1 million times brighter than the corona. A safety shutter is being designed to detect the sudden photon flux should the telescope lose tracking and accidentally observe the solar disk while in coronal observing mode. When closed, this safety shutter will shield the Cryo-NIRSP instrument from damaging solar radiation. The purpose of this project was to calibrate a sensitive cryogenic infrared photodiode that will be used to detect radiation levels inside the instrument and trigger the shutter. This infrared photodiode will be used with an operational amplifier circuit in order to amplify the signal received by the detector inside the Cryo-NIRSP instrument. First, the photodiode was subjected to various tests in a cryogenic environment using a variable temperature “blackbody” to calibrate the expected photon flux from the infrared photodiode. From these tests, a known calibration curve was developed for observation of the radiation levels in the Cryo-NIRSP instrument. This circuit will later be incorporated into the greater safety shutter system, and then installed in Cryo-NIRSP once the mechanical shutter assembly is complete.